SABA was founded in September 1998 by Jean Clough, LMP and Marty Ryan, LMP to provide a calm healing place for clients and practitioners. Marty has since moved on to focus on his abdominal massage instruction and massage. See loveyourguts.net for more information. Jean continues to run SABA on its core values. Jean's commitment is to provide a space that is clean, professional, welcoming, consistent, has staying power, meets client needs, and is continually improving. People often comment on the "good energy" of the clinic. We are primarily a treatment/medical type clinic but we also focus on nurturing and facilitating healing through holistic attention to the clients we see. All practitioners at SABA are self-employed. Emily Bowen, LMP notes "SABA is the cream of the crop. 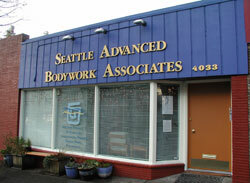 Some of the most experienced and talented bodyworkers in Seattle are here." Coming together as SABA we have created a community of collegial co-workers, committed to helping people create good health in their lives. As Nate Starling, LMP puts it: "We are not just about injury or stress recovery, but also about recovery of good energy, good balance, and good perspective."